So, what were they for? Some scholars have made an attempt to interpret the guldgubber and their function. The common interpretation is that they were a kind of temple money for a named god, e.g. Odin or Freyr which was made very popular by the German scientist Karl Hauck. 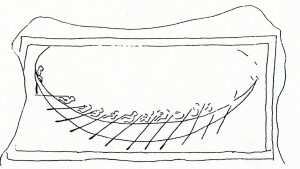 Hauck identifies especially the men with the Sturzbecher with the god Freyr, as the beaker, which the man is holding, contains his folded ship Skidbladnir, which is obvious from the ends sticking out of the vessel. This is a carved ship in a standing stone. If one imagined this to be folded, it might look like the the one above – at least in Karl Haucks view. Other scientist, inlcuding me, are totally opposed to that idea and do not think, that the stuff sticking out of the glas is rather a fluid to show the vessel is full, than a ship. The doublegubber were first seen by Gro Steinsland as the couple Gerdr and Freyr, as is stated in the Skírnismál. But those two are never mentioned as a loving couple after that and the marriage related in the Skírnismál is not one to look forward to, as it was forced. However, it is rather difficult to identify individual gods by taking hints from another period: the Viking Age. The first interpretation, which starts with the attributes and the displayed scenes on the guldgubber rather than identifying them as Viking Age gods, gives only an idea for some guldgubber but not for the whole corpus. 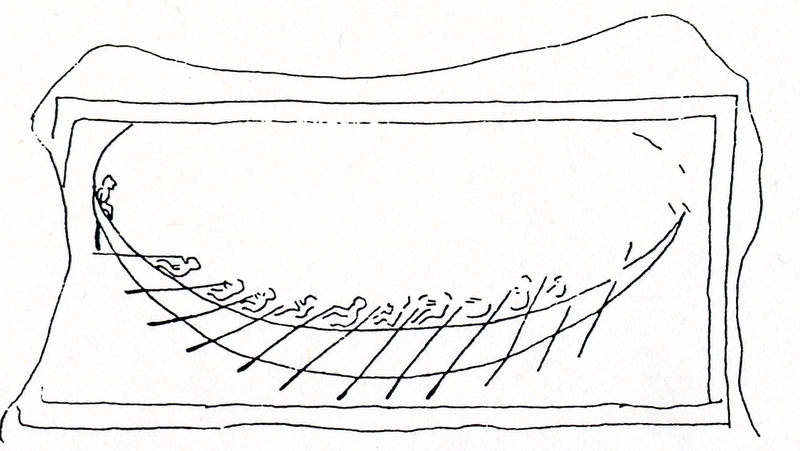 Rudolf Simek tries to explain the attributes seen on the guldgubber and states that the “paddle” on the gubber with a man and the Sturzbecher, resembles an ancient wine lifter. He was the first to put forward the idea of a law context for the doublegubber and tried to prove it with the Heidelberger Sachsenspiegel and the theory of a legal munt marriage. I shall refrain from naming gods and will present three new hypotheses of the symbols and function of the guldgubber. Two of the three presented theories use only the pictures of the guldgubber and archaeological information to arrive at the usage or function of the guldgubber, while the third establishes an iconographical relation to other – later – sources. Regardless of the theory chosen, the possible use of the guldgubber is the same. As they were found around post-holes, it is very likely that they were fixed with resin to the posts, so that they could be seen. They must have fallen off after a time, which probably did not matter or was even intended. Whatever their real function was, the people of the Vendel Period, in their making of guldgubber, revealed a very clear artistic ability and a highly complex symbolic thinking with an ability to establish an interesting symbolic system which has not been solved yet.